In addition to a new, more powerful four-cylinder engine and new eight-speed automatic transmission that adds two cogs, the redesigned RAV4 offers new trims when the gasoline model goes on sale late this year and the hybrid arrives in showrooms in early 2019. 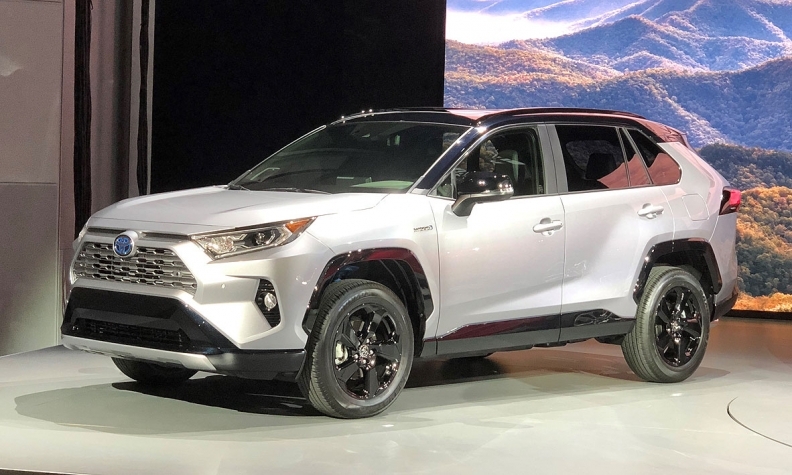 NEW YORK -- Toyota is giving the fifth-generation RAV4 compact crossover a beefier body, more powerful engine and Camry-like range of trim combinations, giving it more ammunition to defend its crown as the top-selling utility vehicle in Canada last year. Toyota sold 50,894 RAV4s in 2017, outselling the Honda CR-V by just 451 units. The update gives the RAV4 more ammunition to defend its crown as the top-selling nonpickup in the nation last year against an ever-growing field of competing small crossovers. The 2019 model, which is being presented Wednesday at the New York auto show, rides on the automaker's new global platform and carries over little more than the badging, Toyota says. There are even two-tone paint jobs on the top-end tiers, an addition that borrows from last year's redesigned Camry by creating more stylistic distance between the regular L and sporty S trim families. The RAV4 Adventure grade, introduced last year, can now be had with a white roof and black, blue or "lunar" green body color. The XSE hybrid -- a new trim for the gasoline-electric version -- comes with a black roof and body in white, silver, gray or blue. The styling takes cues from bigger SUVs to give it a more trucklike presence, and the nose has similarities to the hefty front end of the Toyota Tacoma pickup. "An emphasis was placed on maximizing the presence of a small SUV while maintaining high levels of finesse inside and out," Toyota said. "The stronger nose leads to a more dynamic profile, robust shoulders, and available 19-inch wheels, making for a powerful stance." Mechanically, the all-wheel-drive system has new tricks such as switching to front-wheel drive on the fly to save gasoline, and sending more power to the rear wheels on some versions for better off-road capability and on-road cornering. The Toyota New Global Architecture, a version of which is also used on the Camry, allows for suspension components to sit lower to the ground, giving designers more freedom with the sheet metal while lowering the centre of gravity. The RAV4 is now slightly wider but about the same height and length as the outgoing version. The RAV4's interior also catches up to rivals such as the Honda CR-V with Apple CarPlay integration, options such as wireless smartphone charging and panoramic moonroof, and a standard seven-inch tablet-style screen that sits high on the dash. The Limited trim comes with a rearview mirror that can also display a wider rear-camera view. Toyota's standard Safety Sense 2.0 package has some additions. On the highway, "lane tracing assist" helps keep the vehicle centred in the lane. "Road sign assist" can identify street signs such as "stop," "yield" and "do not enter" and display an alert when appropriate. Toyota provided no pricing information, fuel economy estimates or specific power output of its new engines, all of which are typically released just before launch.